The Activa i now retails at Rs 48,059 (ex-Delhi. For 2017, the Honda Activa i comes with a BS-IV compliant engine and Always Headlamp on. It also gets a new dual tone paint job and an underseat phone charging socket.. Having completed more than a decade in the Indian automotive market, the scooter has set quite a few sales records and scored well on every aspect. Powering it is a 109.2cc, air- cooled, four-stroke single cylinder engine that pumps out a peak power of 8.03PS at 7500rpm with a maximum torque of 8.94Nm at 5500rpm. With an automatic V-matic transmission and Honda’s HET (Honda Eco Technology), the scooter hits a top speed of 83kmph and delivers a fuel economy of 60kmpl. Built on a high rigidity underbone type frame, the scooter runs on 90/100-10 tubeless tyres fitted on steel wheels. Suspension duties are handled by a link-type hydraulic suspension at the front and a spring loaded hydraulic shock absorber at the rear. Braking is via a pair of 130mm drum brakes that are aided by Honda’s Combined Braking System (CBS). The biggest change is the shift to a fibre body from the traditional metal body that the Activa comes with. The refreshed model gets a restyled headlamp section with new clear lens turn indicators mounted at the apron. The rear ends receive an impressive upgrade with the addition of a restyled tail lamp section. Twin air vents are provided on either side of body panels that look stunning. A rear tyre hugger is equipped to prevent the pillion rider from mud and water splash. Honda Activa i body dimensions are 1,795mm x 705mm x 1,115mm (LxWxH), which give it a respectable stance in the public. With a wheelbase and minimum ground clearance of 1,238mm and 165mm respectively, the scooter proves its worth in the areas of stability and ride quality as well. The instrument cluster comes in an impressive dual tone colour scheme consisting of an analogue speedometer, fuel gauge and telltale lights. The scooter has a genuine under-seat storage capacity of 18 litres that gives another benefit to the rider. The top speed of 83 kmph is justified for a price tag of Rs. 53,000 (On-road Price, New Delhi). The suspension has been specially designed keeping in mind the Indian road conditions, so comfort should be the last thing to complain about. The 130 mm front and rear drum brakes with a Combi braking system should give a fair amount of stopping power. One of the best bikes is here for you by Honda. With great features and looks, this is something that you must look for. You will feel glad to have this bike. The Activa i uses a 109.2 cc engine that produces a maximum of 8 bhp at 7500 rpm and 8.74 Nm of torque at 5500 rpm. The engine is mated to v-Matic automatic transmission and comes with self-start and kick-start option. This engine also features Honda Eco Technology, which helps in increasing lubrication within the engine and enhances fuel efficiency. The company claims a mileage of 60 kmpl, so one can expect about 50 kmpl in the city. 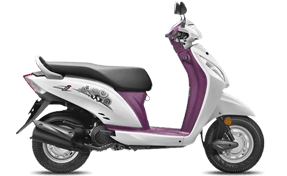 The Honda Activa i is available in the following colours: Alpha Red Metallic, Purple Metallic, Pearl Sunbeam White and Beige Metallic. Other basic features include handy storage spaces, a pillion footrest and a catchy analogue speedometer. Out of different options that Honda offers, this is something which is worth the cost. if you are spending an amount then you will surely expect something great in it and this bike is the best one to meet your desires. Never ever drive on the roads of India without a valid two wheeler insurance if you own one. Two- wheeler has become the necessity of these days and so the insurance coverage. You cant drive legally without it. Just search out for the best bike insurance with the help of an online insurance web aggregator.